Are You a Trustworthy Doorkeeper? In ancient times, the shoulder was known as the burden bearer and became recognized as the symbol of authority and power. Therefore, keys placed upon a person’s shoulder indicated he had been appointed to a high position of responsibility in the king’s palace, granting him authority and free access over the king’s possessions. In wearing the keys of authority, one received the privilege of opening and shutting the doors of the king’s house. The accountability of the keys consisted not only of the oversight of the royal chambers but also of deciding who was, or was not, to be allowed into the king’s presence and service. 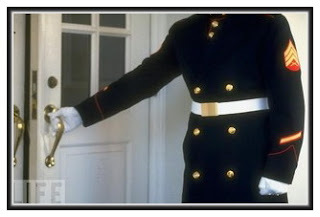 Being entrusted with the keys, the doorkeeper was considered trustworthy and acted as a guard stationed at any entrance through which someone unwanted might enter, especially at night. He stood at the threshold, as a sentinel, allowing nothing of his master’s to leave the premises. *prevented the unclean from entering. This honorable position also warranted a living chamber in the temple. In essence, he told the doorkeeper to keep guard at the gate, not letting anyone in that did not belong, such as strangers or enemies trying to gain entrance to rob the master’s house. Do you see anything in all that? *and charging us to protect the doorway to our hearts and preventing anything unclean to enter His temple. How well do you guard the sacredness of your temple, the King’s palace within your heart? How well do you prevent the unclean from entering, the unwanted salesman soliciting your attention? Do you stand sentinel at your heart’s door, opening only at the voice of the Shepherd? Are you a faithful and trustworthy doorkeeper? This is an interesting analogy… food for thought. Lynn, great lesson. I could be better! Thank God He’s forgiving and a God of 2nd chances. I must be ready when HE comes back! Amen. So this has sent me off to learn more about shoulders–and to brush off the doormat. Another lovely post, and fascinating question and challenge. Every day I apply myself to being a trustworthy doorkeeper. Soon and very soon, our King will be returning and I want Him to find my temple in order. Lynn, this is wonderful! Too often I find these scriptures applied to keeping people out of church or church activities, sadly, no wonder there’s low participation. I think you’ve cut it right here in keeping the unclean thoughts out of our hearts. Excellent work!